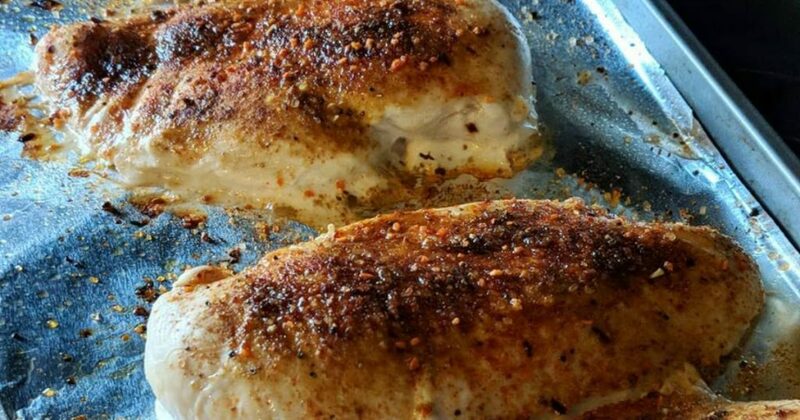 lol ok maybe I’m being a little dramatic with the subject line there…..but every time I share this people come back telling me they cooked their chicken breasts this way and it was so good and easy. Other than grilling, it’s the only way I know to cook chicken so it doesn’t get dry at all. 3️⃣ Trim off any extra fat/tendons then season chicken breasts with whatever seasoning you like (this was memphis bbq and Sriracha garlic mixed together). NOTE: you may need to cut your breasts in half at this point if they are super thick. 4️⃣ Cook for 7 minutes, flip and season the other side, and cook for 7 minutes more. You will have perfectly moist chicken every single time! Serve it up with some brown rice and burned broccoli and you have an awesome, easy to clean up, healthy dinner.